Windows 7 does not allow users to “downgrade” or convert from a more premium and more expensive edition to down-level, more basic and less expensive edition. For example, it’s impossible to downgrade from Windows 7 Ultimate to Windows 7 Professional or Enterprise, or from Windows 7 Professional to Windows 7 Home Premium or Home Basic. 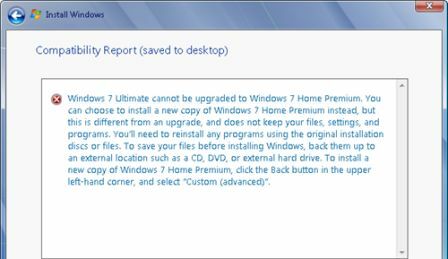 Windows 7 Ultimate cannot be upgraded to Windows 7 Home Premium. You can choose to install a new copy of Windows 7 Home Premium instead, but this is different from an upgrade, and does not keep your files, settings and programs. You’ll need to reinstall any programs using the original installation discs or files. To save your files before installing Windows, back them up to an external location such as a CD, DVD, or external hard drive. To install a new copy of Windows 7 Home Premium, click the Back button in the upper left-hand corner, and select “Custom (advanced)”. The refusal of Windows 7 to downgrade causes several groups of people some headache, especially when user doesn’t want to lose and wipe off existing programs installed. For example, users who installed Windows 7 Ultimate during beta or release candidate phase of Windows 7, but now acquire a Windows 7 Home Premium or Windows 7 Professional license. The situation can also apply to user who installs Windows 7 Ultimate or Professional edition, but now wants to go legit by buying or being given a gift of Windows 7 Home Premium license. End-users also have to go through the hassle of backup all data files when clean install is required. Microsoft probably forbids downgrade for a reason, such as possibility of corrupting or messing the operating system and complexity involved in such downgrade. For user who must perform in-place downgrade, there is a workaround trick that can force Windows 7 setup installer to allow “upgrade” or downgrade from uplevel edition of Windows 7 to downlevel version of Windows 7, while retaining all installed application software, drivers and migrating all documents, music, video, shortcuts, bookmarks, favorites, and personal data files or settings. On existing Windows installation, run Registry Editor (RegEdit). In the right pane, change the value data of EditionID and ProductName to reflect a minor version of Windows 7. Note: The ProductName and EditionID should have the same name with the Windows 7 operating system name displayed during OS selection on the installation DVD. Some Windows 7 installation DVD may use “Windows 7 Home Premium” as OS name. See the hack to enable Windows 7 OS edition selection during setup by disabling ei.cfg to create universal Windows 7 installer ISO. Start Windows 7 installation by inserting Windows 7 DVD disc into disc tray, or mount the Windows 7 ISO image into a virtual drive. Select Upgrade as type of installation. Then, continue to install Windows 7 as per normal. For user who decided to upgrade from Windows 7 Beta or Windows 7 RC release, the Windows 7 upgrade paths also does not support direct upgrade any prerelease versions of Windows 7. However, an easy hack of modifying cversion.ini can enable direct upgrade to Windows 7 final from Windows 7 RC or Beta. One last note is that after the “downgrade” of Windows 7 installation, the operating system must be reactivated.